You might say the business weather today for tradeshow companies is cloudy with a chance for financial rainmaking. Cloud computing — the business of manipulating, sharing, storing and backing up documents and data through remote computer servers —is becoming a major tool for the tradeshow industry. Companies that use cloud storage companies like dataprotection.com online backup do so to earn more, decrease costs and improve accessibility to company information wherever their staff and trade shows may be. GraphicColor, a company that produces modular and portable trade show displays, recently noted that increasing use of cloud technologies was noted in the “2012 Trend Tracker” of GES, a company specializing in trade shows and branding. As GraphicColor pointed out, trade shows are combining the Internet with interactive displays that command attention from viewers online as in exhibit halls. Cloud computing is beginning to lead trade show technology. Here are five ways that it is changing business. No doubt about it, video commands the eye. However, as powerful as portable computers may be, they can’t store as much as servers. The powerful remote servers of cloud storage companies let you easily access all the visuals you want to present as part of exhibits and presentations. Forget about packing up all those boxes full of company brochures, flyers and other promotional materials. It is becoming common to use digital collateral instead. Trade show publisher CMW cites mobile applications — such as Follow Me, Show Guide and the Digital Collateral Scanner — that allow exhibit hall visitors to lighten their load. Instead of picking up paper collateral, they can download exhibitor information digitally via smartphones. The growing dependence on smartphones and computer tablets can help you market directly to attendees before and after a tradeshow or in real-time during the event. Digital notices may include interactive floor maps and alerts about presentations and contests. CMW cites mobile applications, such as Ustream Live Broadcaster, as making it possible to send out live demonstrations and press announcements via popular social media avenues, such as Twitter and Facebook. As to how to use social media, the All Things CRM website offers valuable tips for getting out your company’s message before, during and after a show. One must-do is to create a Facebook event page promoting a show or exhibit and, eventually, recapping the event. Photos taken at the show can be shared through sites such as Tumblr and Flickr. 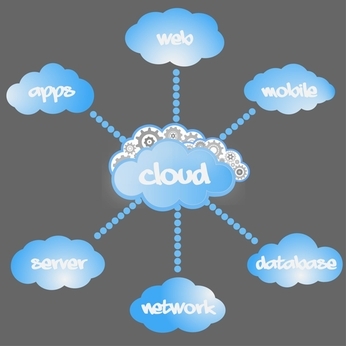 Cloud computing is also becoming the subject of tradeshows, including the October 2012 Taiwan International Cloud Technology and Internet of Things Show. Perhaps you might be feeling clueless about what “internet of things” means. However vast this part of the Internet may be one of the opportunities it holds is better tracking of merchandise. The ReadWriteWeb site notes that the Internet of things is a network of objects that are equipped through tracking devices to interact with web services via smartphones, computerized sensors and radio frequency identification devices. Nevertheless, as you deposit valuable company files in this electronic vault, remember to seek secure backup. To avoid worrying about the security of company data and visuals stored away from in-house IT departments, be sure to select a reputable cloud computing backup company. This entry was posted by admin on October 15, 2012 at 12:19 am under Cloud Computing. Tagged Cloud computing, Data Backup, Data Protection, GraphicColor, Trade Show. Responses are currently closed, but you can trackback from your own site. Follow any responses to this entry through the RSS 2.0 feed.